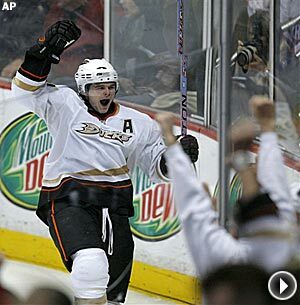 Chris Kunitz's 20th goal of the season broke a 1-1 tie with 7:24 left in regulation, as the Anaheim Ducks earned a franchise-record seventh straight win at home with a 3-1 victory over the Montreal Canadiens. Playing against his favorite team as a child was all the incentive Jean-Sebastien Giguere needed to lead the Anaheim Ducks to a franchise-record seventh straight win on home ice. Giguere made 20 saves on Sunday night and won for the 10th time in 12 games as the Ducks continued their winning ways at the Honda Center with a 3-1 victory over the Montreal Canadiens, who remain a point behind the New Jersey Devils for the Eastern Conference lead. 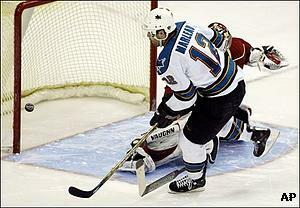 Anaheim got off to the start it was hoping for as Todd Marchant scored just 21 seconds into the game. But Alexei Kovalev tied things up about eight minutes later, as he reached the 30-goal plateau for the fourth time in 15 seasons. After a scoreless second period, Chris Kunitz broke the 1-1 tie with 7:24 left in the third. With the teams at even strength, Ryan Getzlaf carried the puck from behind the net and sent a cross-ice feed to Kunitz, who slammed it home for his 20th goal of the season. Samuel Pahlsson increased Anaheim’s lead with a shorthanded goal just 33 seconds later. With Todd Bertuzzi in the box, Scott Niedermayer came down on a 2-on-1 with Pahlsson, and the latter one-timed Niedermayer’s feed past Carey Price as the Ducks took a 3-1 lead. It was only the third shorthanded goal allowed by the Canadiens this season. ''It's tough to give up a goal in the third period. It's even tougher to give up two, because you know you were so close the whole game,'' Price said. The Ducks came out victorious despite going 0-for-8 on the power play. They are just 2-for-45 with the man advantage against Montreal since the start of the 1998-99 season. Brad Richards scored his first goal in a Stars’ uniform, and Marty Turco stopped all 19 shots he faced as Dallas snapped a three-game skid with a win over Colorado at the American Airlines Center. With the victory, the Stars were able remain in first place in the Pacific Division. San Jose remains a point behind following its win over Minnesota. Stu Barnes and Stephane Robidas also found the back of the net for the Stars, who ended Colorado’s six-game winning streak in dominant fashion. The Avalanche mustered only one shot on goal in the opening period. Richards – who had five assists in his first game with Dallas after being acquired from Tampa Bay on Feb. 26 – gave the Stars a 3-0 lead 6:55 into the second period. 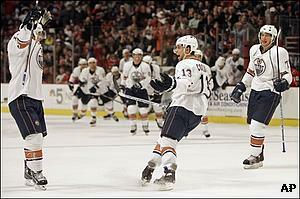 He also added an assist and played well on a line that was centered by veteran Mike Modano. ''It's an adjustment, but it's easier playing with a guy who thinks the game like (Modano),'' Richards said. Colorado was forced to play without center Peter Forsberg, who suffered a groin injury on Saturday in a 3-1 win over Dallas at the Pepsi Center. Forsberg is listed as day-to-day. Avs coach Joel Quenneville tried to shake things up at the start of the third period by replacing starting goalie Jose Theodore with Peter Budaj. Barnes and Robidas scored in the first 5:25 of the game to give Dallas a 2-0 lead. ''I gave Jose a rest and (hoped to) change momentum maybe,'' Quenneville said. Johan Franzen scored two power-play goals as the Red Wings held on for a 4-3 victory over the Nashville Predators in defenseman Nicklas Lidstrom's return to the Detroit lineup. A three-goal third period by Nashville nearly ruined what ultimately turned out to be a triumphant return for Detroit defenseman Nicklas Lidstrom. The Red Wings appeared to be on cruise control after 40 minutes, but goals from Shea Weber, Martin Erat and Jordin Tootoo made the final moments tense for Detroit and Lidstrom, who missed the last six games due to a knee injury. "I felt good,” said Lidstrom, who had two assists in his return. “It helped early on to be on the power play a lot and get a lot of ice time. You're able to hold on to the puck a lot more and make plays. That helped me get used to the game speed. ... The knee feels well now. Tomorrow I'll push it a little more. I don't anticipate any problems." 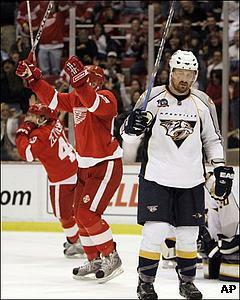 Johan Franzen opened the scoring with a power play goal 11:17 into the game. With the Red Wings on a two-man advantage, Franzen parked himself in front of the net and redirected Henrik Zetterberg’s feed past Chris Mason for his 15th goal of the season. Detroit capitalized again on the power play when Jiri Hudler put his team up by a pair with 4:17 left in the first. After Radek Bonk was whistled for tripping, Hudler one-timed a pass from Niklas Kronvall past Mason for his first goal since Jan. 12, a span of 21 games. "You don't want to come in here and spend the whole first period in the penalty box," Predators coach Barry Trotz said. "Too many penalties. Some were warranted and some weren't." Detroit increased its lead to 4-0 with a pair of goals that came only 1:06 apart in the second period. Brad Stuart scored at even strength at 15:21 before Franzen scored his second power-play goal of the afternoon when he redirected Lidstrom’s shot past Mason. Stuart – playing in his sixth game after being acquired from the Los Angeles Kings – skated alongside Lidstrom for the first time. "He makes the game back there look so easy," Stuart said. "And as a teammate, you see that and it gives you more confidence. ... It would take a while to tell all the things he does well." Things began to unravel for the Red Wings midway through the third period. Weber and Erat scored on the power play just over three minutes apart before Tootoo made it a one-goal game at 18:59 with Mason pulled for an extra attacker. Dominik Hasek, who stopped J.P. Dumont on a breakaway about 40 seconds before Tootoo’s tally, finished with 20 saves for the victory. "I think we know what went wrong in the third," Stuart said. "We took our foot off the gas a little bit ... We took a few penalties. That's not going to help you." Henrik Lundqvist had to go the extra mile to record his ninth shutout of the season. The New York netminder stopped 29 shots through regulation and overtime before going 3-for-3 in the shootout, as Lundqvist outdueled Alex Auld at Madison Square Garden. Lundqvist’s performance helped the Blueshirts jump one point ahead of the Bruins for the No. 6 seed in the Eastern Conference. Each team has 13 games remaining. "It was fun to play and it felt really good to finally beat them in a shootout," said Lundqvist, who battled fatigue and a sore throat. "They had a couple of good players who made a couple of good moves. It was a big statement for us to beat this team." Nigel Dawes scored the lone goal of the afternoon, as he fired a wrist shot past Auld in Round 2 of the shootout. "I was just thinking about trying to get the puck past him. He played an unbelievable game," Dawes said of Auld, who made his fifth straight appearance. "I just wanted to find an opening, and the first thing that popped out at me was low blocker." For the Bruins, it was their second 1-0, post-regulation loss in five days. They lost by the same score to the Florida Panthers in overtime last Tuesday. Boston, which played its third game in four days, is 1-2-2 in its last five. "It was a hard-fought game," Auld said of the latest loss. "It would've been nice to come out ahead of them, but it was a big point for us, too. It's playoff time and that's the way it is. Every point is so crucial. Everyone is battling so hard, and teams are getting to the point where they're really limiting mistakes. We're right along with that." Both teams had solid chances in regulation. Chris Drury and Sean Avery both hit crossbars for the Rangers, while Lundqvist made a diving glove save on Glen Metropolit in the third period. "It's one of those things where sometimes you're not feeling well and you're kind of loose, but you also have to really concentrate," Rangers coach Tom Renney said. "He played very well." Oilers' rookie Andrew Cogliano scored in overtime for the second straight game to lift Edmonton to a 6-5 win over the Chicago Blackhawks Sunday at the United Center. Andrew Cogliano did it again for Edmonton in overtime. The Oilers’ rookie scored in the extra session for the second straight game, as Edmonton improved to 6-1-0 in its last seven games with a win over Chicago at the United Center. Cogliano’s overtime tally gave the Oilers their 17th post-regulation victory of the season. Edmonton coach Craig MacTavish attributed the telling statistic to goaltending. The Oilers are 14-3 in shootouts this season, thanks to the stellar play of Mathieu Garon, who made 33 saves on Sunday. "It's been very good," MacTavish said. "Garon's stopped 30 of 32 shots in shootouts. Normally one goal is enough and we have enough guys to score one." Neither team had a two-goal lead on Sunday in what was a seesaw affair. After Dustin Penner gave Edmonton an early 1-0 lead, Chicago’s Patrick Sharp scored his 34th goal of the season at 7:49 of the first. Robert Nilsson – who assisted on Cogliano’s game-winning tally, erased a 3-2 deficit with 1:24 left in the second. "It was that kind of game at both ends of the ice with some weird goals," said Blackhawks goalie Patrick Lalime, who started as Nikolai Khabibulin missed his ninth straight game due to back spasms. "The puck bounced here and there, but we battled hard." Cogliano broke a 4-4 tie 6:12 into the third period with his 14th goal of the season, but Dustin Byfuglien beat Garon on the doorstep with 4:35 remaining to send the game to overtime. Cogliano – who enjoyed his first two-goal game in the NHL – won it 3:01 into the extra session when he redirected a cross-ice feed from Nilsson past Lalime for his second straight OT winner. "It was a nice play by Nils," Cogliano said. "He does a good job of finding guys around the net. I was going back-door and had an empty net on my stick." Finally, Columbus made sure its fans left Nationwide Arena with a smile. Jason Chimera broke a 3-3 tie with 3:44 remaining as the Blue Jackets ended a seven-game winless skid on home ice with a victory over Tampa Bay to move within five points of a playoff spot in the Western Conference. "To come back and win in the third period is the best feeling for us right now," Columbus coach Ken Hitchcock said. "You start to have doubt in your game ... but winning like tonight can relieve some of those problems." Chimera’s goal solved a huge problem – the power play. The Blue Jackets hadn’t scored in their last 34 opportunities with the man advantage. After Jeff Halpern was whistled for holding, Chimera redirected Nikolai Zherdev’s shot past Mike Smith for his 14th goal of the season. "We've been disappointed with the way we've played at home since the All-Star break," Blue Jackets center Michael Peca said. "It's good to see us be a little more resilient tonight." Tampa Bay tied the game late in the second period when Vincent Lecavalier scored on a penalty shot after being hooked from behind by Jan Hejda. Martin St. Louis had gotten the Lightning within one at 3-2 roughly a minute earlier when he fired a slap shot from the left circle past Pascal Leclaire for his 22nd goal of the season. Jiri Novotny iced the victory with an empty-net tally with a minute remaining in regulation. Tampa Bay has lost five straight and 10 of its last 11 games. "I thought our team played hard, defended well, didn't give up many opportunities at all," Lightning coach John Tortorella said. "We scored a couple goals and played good enough to lose." Sharks captain Patrick Marleau scored the winning goal in the shoot-out as San Jose won their franchise-record ninth straight game with a 3-2 victory over the Minnesota Wild. In a game featuring teams headed in opposite directions, San Jose extended its winning streak to nine when Patrick Marleau scored in the shootout to beat Minnesota at Xcel Energy Center. The Wild – who fell to 3-6-2 in their last 11 games – weren’t all that deflated afterward. Brian Rolston erased a 2-1 deficit with just 28.8 seconds remaining in regulation and gave Minnesota a much-needed point in the standings. "Guys were on the puck. We were skating as a team, battling. We were sticking together," Wild forward Pierre-Marc Bouchard said. "There's 12 games left, and they're all important." Meanwhile, the Sharks can do no wrong. The NHL’s best road team (24-8-3) coughed up a 2-0 lead but still found a way to survive. Their nine consecutive wins is a franchise record. Seven of those victories have come on the road. "A little bit of confidence, it goes a long way," San Jose coach Ron Wilson said. "We're at a point right now where a little bump isn't going to hurt us." Milan Michalek gave the Sharks a 1-0 lead just 46 seconds into the contest, when he took a pass from Brian Campbell and fired a wrist shot from between the circles past Niklas Backstrom for his 21st goal of the season. Tomas Plihal made it 2-0 when he scored on a penalty shot at 13:44 of the first. It was the first allowed at home by Minnesota since the franchise began in 2000. Kurtis Foster started the comeback when he notched his seventh goal of the season at the 4:11 mark of the second period. "Obviously, we're playing well, but it's such a competitive league that you can't get too comfortable," said San Jose goalie Evgeni Nabokov, who finished with 21 saves. "If you're going to take time off, you're going to find yourself losing two in a row and fighting for that eighth playoff spot." The Wild went 0-for-2 on the power play and have scored only twice in their last 23 chances, a span of five games. They still have a one-point lead over Calgary and Colorado in the Northwest Division, but are three ahead of No. 9 Vancouver. "I think we'll play as good as this in the next games, all the games that are left," Minnesota coach Jacques Lemaire said. "So now we will determine if we're good enough to be there. That's how it's going to be."